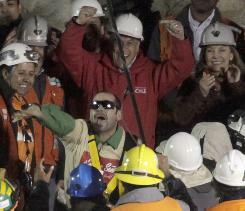 Chile's President Sebastian Pinera greets one of the first miners rescued after being trapped underground for 69 days. I am especially mindful of how God comes to the rescue of those who call on Him, around this time of the year. As we approach Halloween and some of its negative aspects, such as pranks, I recall an incident a friend shared with me when he went to live with a relative in the rural South where there was no indoor plumbing, and everyone used an outdoor toilet known as an “outhouse.” Unbeknownst to my young friend, the custom on Halloween night was to move the “outhouse” from its original position so that when a person stepped inside, he would fall into the pit. That’s exactly what happened, and my friend immediately cried out, “Daddy, Daddy, come and get me!” His father came running with a flashlight and reached down and grabbed his son by the collar and snatched him out of the horrible pit. Last year I published an Examiner.com article regarding this valuable lesson that I learned from a Halloween prank.. Here is a link to the original article from which this discussion was taken.